A year after he retired from the Fed, the shadow of former Chairman of the Federal Reserve Ben Bernanke still looms large. Bernanke was the top dog at the Fed for a long eight years, spanning two altogether dissimilar presidential administrations. He came in under Bush in 2006 and left under Obama in 2014, and there was no shortage of controversy throughout his tenure. After all, Bernanke was at the helm during the worst U.S. financial crisis since the Great Depression. On Wednesday, Bernanke will appear on The Late Show with Stephen Colbert, where he will likely be discussing his memoir, which came out Monday: The Courage To Act. Prior to his Colbert appearance, here are four things about Bernanke that his new book lets us all in on. Admittedly, The Courage To Act is a rather self-aggrandizing title — it's cut from a similar cloth as Mitt Romney's No Apology and Hillary Clinton's Hard Choices. But as in any worthwhile career reflection, it shines a little light on Bernanke's professional and personal sides alike, with some pretty amusing details. For example, how many Fed chairmen would you have guess had a big-time jones for Hot Pockets? At the very least, your best guess should officially tick up from zero to one. 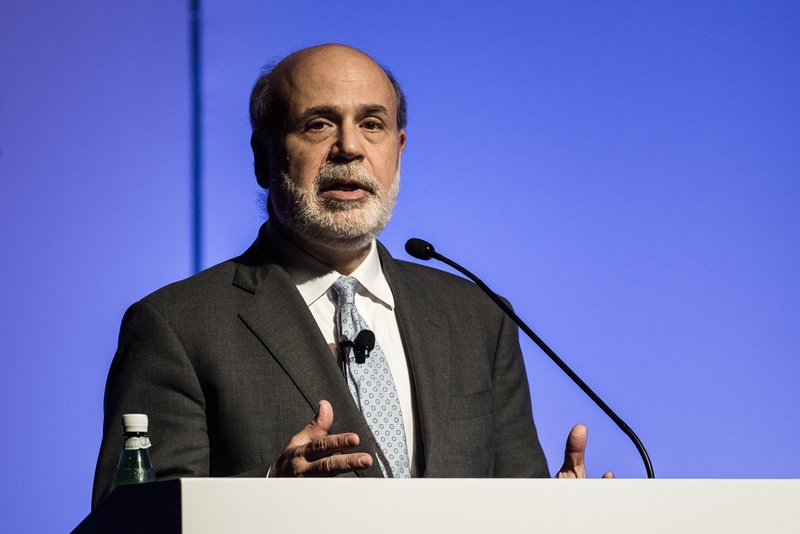 Here are four things about Bernanke that might surprise you, courtesy of the man himself. As detailed by CNN Money, Bernanke's mother was apparently worried when he started driving again at age 60, after eight years away from a steering wheel. She apparently feared he wouldn't remember how to do so safely, which you have to imagine might rankle a guy who's also tasked with mitigating a financial crisis on a global scale. For Bernanke's part, he says that his driving has been "so far, so good." That's how it sounds, at the very least. CNN Money also noted that Bernanke pulls back the curtain on Geithner's surprisingly robust appetite for donuts. He wrote that the former United States Treasury Secretary would "inhale" donuts during break time, but "nevertheless remained slim" — the sort of observation that plenty of us have made through gritted teeth at one time or another. Also, it sure sounds like Geithner was a little more impressed with Bernanke than vice versa when the two first met. According to The New York Times, Bernanke wrote that "I would ultimately become a big fan of Tim’s, but when I first met him I was underwhelmed." Admit it, when you see those slick-suited folks walking the halls of power in Washington, you instinctively assume they must be Living Better Than You. You know — lavish parties, refined tastes, only the finest things in life. And yet, as Quartz detailed, Bernanke gives readers some intimate insights into his sometimes-trashy food tastes. Specifically, he writes that when he was staying at his Georgetown apartment prior to the financial collapse, he'd often either visit one of his favorite Vietnamese restaurants — good deal — or satisfy himself by eating a Hot Pocket, which is ... not so glamorous, needless to say. Those days are now behind him, however, unless he whips up a DIY, gluten-free Hot Pocket alternative. He cut gluten out of his diet on his doctor's advice, which he credits with easing digestive problems that plagued him in the early days of the crisis. Sure, this isn't exactly bold or unpredictable news — Seinfeld is one of the most popular shows of all time. And yet, the prior image of Ben Bernanke eating a Hot Pocket in his apartment at the end of long day isn't quite complete without that additional fact: He specifically writes that he'd unwind with a Hot Pocket and an old episode of the hit NBC sitcom. And that's got to make you feel at least a little closer to the old Fed chairman, right? Knowing that that he could probably tell you in what order the Seinfeld gang dropped out of their masturbation contest, for example? Or how much time you've got to eat a Mackinaw peach? Power brokers: They're just like us!